WSP Blog Presents apparent Conundrum to the NYC Parks Dept with the Question: What is Amount of Public Space around the Washington Square Park Fountain? In attempting to clarify a simple point of information from the NYC Parks Department Press Office last month, I first received a gracious response — followed by a drop-off in communication. Did I per chance hit upon something that the Parks Department does not want to admit or state publicly? It’s basic information contained within Phase I of the redesign work. The same work they state will be completed in November. My curiously difficult-to-answer question to the NYC Parks Department? 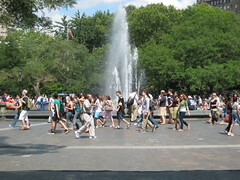 … : What will the size of the Plaza area (the public space) surrounding the Washington Square Park Fountain be? I wrote to Jama Adams, the head of the Parks Department press department at the suggestion of Amy Freitag, #2 to NYC Parks Commissioner Benepe, in early August. Adams assigned Press Officer Cristina DeLuca to assist me. I want to know from the Parks Department what the square footage of – what is usually termed – the “interior plaza area” or “inner circle” around the Fountain at Washington Square Park will be with the renovation of the Park. The figure that I have is that the new interior plaza (which goes from outermost edge of fountain wall to innermost edge of any seating) will be 20,662 square feet. In addition, the Entire Plaza Area around Fountain (which includes and goes beyond this area) will be 39,419 square feet. Hope to have this confirmed for you soon. Waiting on borough staff to give me the info. Just resubmitted request as a reminder. When do you think you might have the information I requested ? It should be within Parks Department documentation for Phase I work of Washington Square Park. Nothing. Since then, I’ve sent numerous emails, I’ve called and left messages. No response. Is the New York City Parks Department is hiding something? 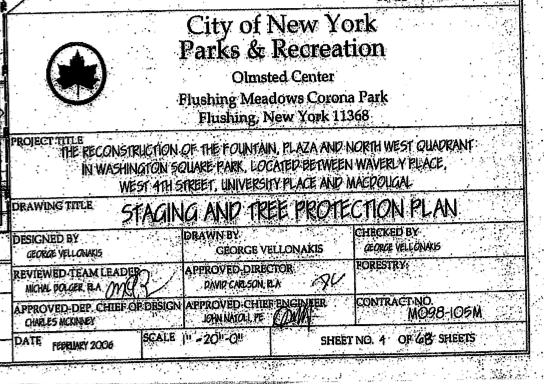 *The Gerson-Quinn Agreement (drafted October 2005), a mild (but weak) document, written to Parks Commissioner Adrian Benepe by NY City Council Speaker Christine Quinn and Council Member Alan Gerson, states its goal as: “a framework for resolving the outstanding major issues pertaining to the renovation of Washington Square Park.” The G-Q Agreement did not in fact even attempt to resolve the major outstanding issues (NOTE: This has made close followers of the redesign question Gerson and Quinn’s intention) but it did stipulate a few things that should nonetheless be adhered to. One such stipulation: That the Fountain Plaza be no less than 90% of the current area. When I questioned WSP Task Force co-chair Brad Hoylman last month if this question was ever answered, he directed me to lawsuit documents* from which I obtained the figures above that I queried the Parks Department about. What is the Parks Department hiding? It appears that the NYC Parks Department does not want to answer this basic – but important question – which impacts our public space. The Press Office is caught in the middle. Hint: Is it Community Board 2? The Washington Square Park Task Force? Community Groups? Alan Gerson? Christine Quinn? None of the above? Week in Review: Union Square Court Decision, Danny Meyer, Washington Sq Park Photo Ops, more. * NYC Parks Commissioner Adrian Benepe previously stated that the 14 trees the City plans to chop down at Union Square Park were “dying” and would have to be cut down no matter what. Yet, in court, the City submitted papers stating that just two of those 14 were “likely” to need to come down. Not definitely. Why can’t these trees be spared the City’s ax? *Artist and activist Robert Lederman exposes how powerful the local BIDS – business improvement districts – are in Mayor Bloomberg’s New York. He details how, privatization, despite cheerleading from the media and CEO Bloomberg himself, has a dark side. At Union Square Park, when artists recently began being harassed by Parks Department police, it turns out this was under direction of the Union Square Partnership, the local BID, which has been given tremendous influence over Union Square Park (by the Parks Department). *Speaking of BIDs, Manhattan Community Board 2 members, who act in an advisory role over Washington Square Park, posed with BID members and Parks Commissioner Benepe in this week’s Villager. They may have forgotten about that vote of April 19th, 2007 in which they rescinded their previous approval of the Parks Department’s “renovation” plans of the Park. The local BID members are giving $250,000 towards the renovation (I gather they approve). Given the overwhelming disapproval of the Community towards the redesign plan of this historic park, and the City’s flawed and non-transparent “process,” I’d hope the Community Board members would realize that they ought to skip photo ops like this. Also in the picture is City Council Member Alan Gerson, which answers my question as to where he is. *Judge Jane Solomon of New York State Supreme Court signed an order on May 7th in favor of the Union Square Community Coalition and granted a preliminary injunction preventing construction of a restaurant in the historic Union Square Pavilion (site of the first Labor Day March in the 1800’s). There’s also the small detail that the New York City Parks Department stated to the court they were never quite sure they were putting in a restaurant anyway. Despite NYC Parks Commissioner Adrian Benepe talking up his pet project (the restaurant) all over town, and applying for Building Permits, that all suddenly became “not yet final” and “subject to further administrative review” when they were forced to backpedal under oath in Court. *Thursday night May 8th was the Brooklyn BlogFest! *Artist William Glackens painted 20 pictures of Washington Square Park between 1909 and 1914. His scenes record the mixing of social classes that occurred in NYC. This magnificent tree on the North side at Union Square Park is a Siberian Elm and one of the trees that NYC Parks Commissioner Benepe wants to chop down to put forth his and Mayor Bloomberg’s redesign of that Park. 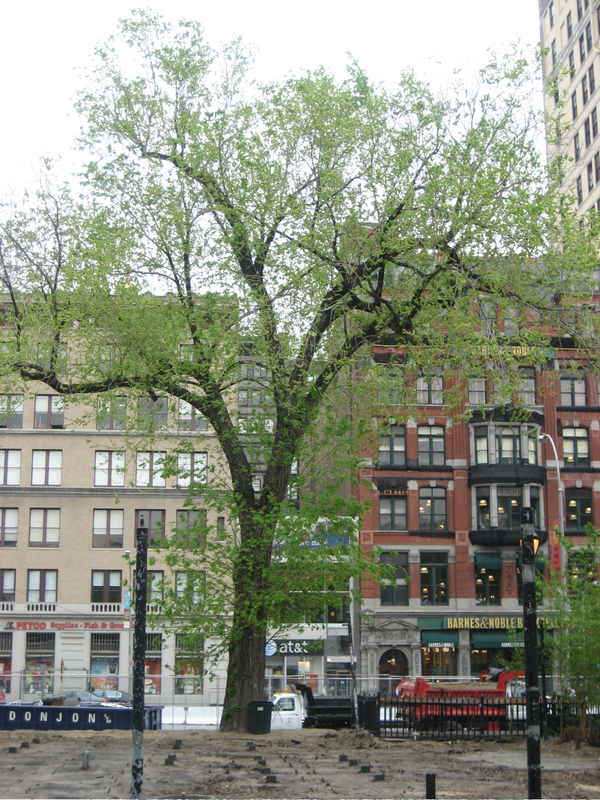 Last week, ONE DAY after Commissioner Benepe asserted to me that 14 trees at Union Square would have to come down no matter what because they are “dying,” the City presented in Court legal documents which state of the five “mature” Siberian Elms: “it is likely that two of those five would be removed in the near future for public safety reasons.” Likely. Not definitively. Two trees. Not all. These documents reflect the City’s opposition to stopping work on the Pavilion at the North end and were entered into the court record as part of the lawsuit brought forth by community groups. Mayor Bloomberg’s administration wishes to privatize the historic Pavilion and place a restaurant there. To clarify, there was a restaurant at Union Square previously but it was located in the “sunken terrace” next to, not in the Pavilion. The Pavilion has always been allocated for Community use and historically as a location for activism and protest marches in the City. Presently, there is a temporary restraining order in effect and preliminary injunction on the cutting down of trees and a stop work order on the Pavilion site. Will Parks Commissioner Benepe and Mayor Bloomberg ever reverse course and work with the truth and with communities? When the City puts together a plan to, say, redesign a park, they put out something called a Bid Document. This is the actual plan and is signed off on by numerous parties within the appropriate agency. In this case it is the City of New York Parks & Recreation Department. This page of the Bid document outlines the number of trees scheduled to be cut down (up to 16! just in the northwest quadrant). There’s something interesting about this Bid Document. You will see the “designer” George Vellonakis signed off, “team leader” signed off, “director” approved it, Chief of Design, and Chief Engineer signed off. Then there is the box for the Forestry Department on a drawing titled “Staging and Tree Protection Plan.” That box is empty. — The Forestry Department oversees the trees. Why didn’t the Forestry Department sign off on the plan to cut down the trees, and what does this mean, if anything, for the City’s plans?